Amazon Connect is a simple to use, cloud-based contact center service that makes it easy for you to deliver better customer service at lower cost. This new service from Amazon Web Services is based on the same contact center technology used by Amazon customer service associates around the world to power millions of customer conversations. Setting up a cloud-based contact center with Amazon Connect is as easy as a few clicks in the AWS Management Console, and agents can begin taking calls within minutes. Amazon Connect’s self-service graphical interface makes it easy for non-technical users to design contact flows, manage agents, and track performance metrics – no specialized skills required. The service also makes it possible to design contact flows that adapt the caller experience, changing based on information retrieved by Amazon Connect from AWS services, like Amazon Redshift, or third-party systems, like CRM or analytics solutions. You can also build natural language contact flows using Amazon Lex, an AI service that has the same automatic speech recognition (ASR) technology and natural language understanding (NLU) that powers Amazon Alexa. Amazon Connect integrates with a broad set of AWS tools and infrastructure so you can record calls in Amazon S3, use Amazon Kinesis to stream contact center metrics to Amazon Redshift or an external data warehouse solution, use Amazon QuickSight for data visualization and analytics, and use AWS Directory Service to allow agents to log into Amazon Connect with their corporate credentials. Amazon Connect also integrates with leading CRM, Workforce Management, Analytics and Helpdesk offerings, so you can embed the Amazon Connect agent experience into the application that your agents already use. 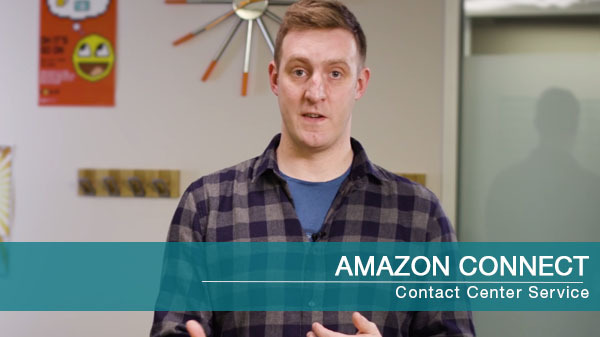 There are no up-front payments or long-term commitments and no infrastructure to manage with Amazon Connect; you pay by the minute for Amazon Connect usage plus any associated telephony services. As part of the AWS Free Usage Tier, you can get started with Amazon Connect for free. Amazon Connect offers direct inward dial (DID) numbers and toll-free numbers in the United States and 18 countries throughout Europe. To get started with Amazon Connect, visit https://aws.amazon.com/connect.